Exploring the intersection of craft, textiles, technology, and activism. Craft has long been a tool of activist movements, whether quilting to spread awareness of AIDS, embroidering as a means to rebel against gender inequalities, or knitting to reclaim public spaces. Likewise, open source technology communities have crafted innumerable tools to support a broad range of issues from human rights to free speech to religious freedom. The hybrid practice of combining craft and technology through eTextiles and electronic crafts presents a potent opportunity to express ourselves and build community dialogue. We seek to design “soft” objects of self-expression and resistance in the face of an uncertain and unstable political environment, locally and globally. In these four workshops, we will experiment with different materials, soft circuitry techniques and tools, then build a prototype that responds to a central question. Participants will explore conductive materials, receive an introduction to Arduino, and learn a range of soft circuit construction techniques including handmade sensors, paper and fabric circuits, shape memory alloys, DIY fabric and paper speakers, thermochromic inks, and more. Diversity is our mandate. Everyone is welcome. No prior knowledge is necessary to participate. All workshops will be thoroughly documented and made available under Creative Commons licenses to replicate and adapt. Liza Stark is a designer, playmaker, and educator based in New York. She sculpts circuits out of fabric and paper, creates game-like learning experiences, and works hand-in-hand with communities to make epic things. Right now her practice focuses on designing performative games that combine electronics & textiles with whimsy & activism to yield embodied learning experiences that question the social spaces we’ve constructed. She teaches Computational Craft in the MFA Design and Technology program at Parsons The New School for Design and her work has been featured in Maker Faire, Open Hardware Summit, CIANT, ACM Conference on Tangible, Embedded, and Embodied Interfaces Conference, eTextile Summercamp at Moulins Paillard, and more. Nicole Messier is a Brooklyn based technologist, maker, and designer whose practice spans across physical and digital platforms that focus on education, interaction, and playfulness. She is also a Creative Technologist at Local Projects and adjunct faculty at Parsons School of Design where she teaches creative coding. Her work has been featured at Maker Faire, Tangible Embedded and Embodied Interaction conference, SXSWedu, The Contours of Algorithmic Life, and more. 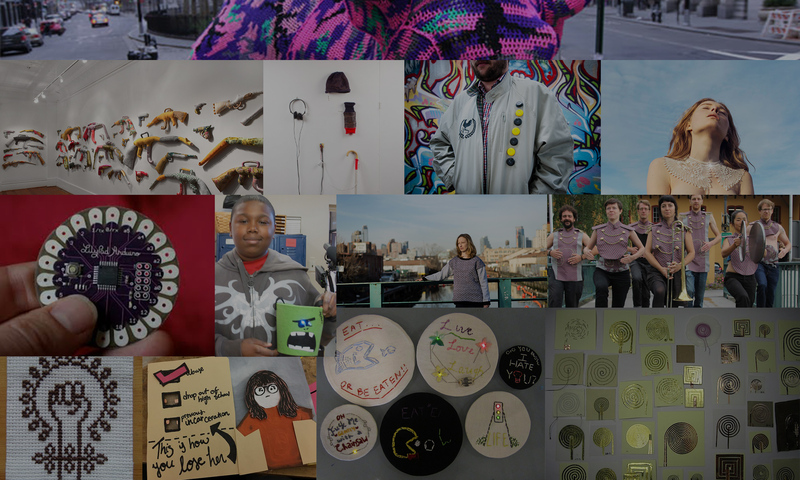 We seek to bring the NYC craft, wearable tech, fashion, and open source technology communities together to investigate new modalities of resistance by exploring the hybrid practices of eTextile and eCraft fields.